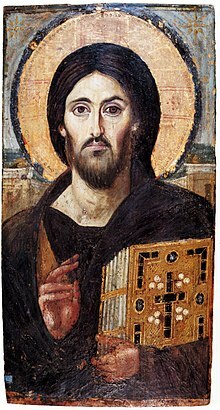 The oldest known icon of Christ Pantocrator at Saint Catherine's Monastery. The two different facial expressions on either side emphasize Christ's dual nature as both divine and human. Composites of the two sides of the face. Hypostatic union (from the Greek: ὑπόστασις hypóstasis, "sediment, foundation, substance, subsistence") is a technical term in Christian theology employed in mainstream Christology to describe the union of Christ's humanity and divinity in one hypostasis, or individual existence. The most basic explanation for the hypostatic union is Jesus Christ being both God and man. He is both perfectly divine and perfectly human. The Athanasian Creed recognized this doctrine and affirmed its importance, stating that "He is God from the essence of the Father, begotten before time; and he is human from the essence of his mother, born in time; completely God, completely human, with a rational soul and human flesh; equal to the Father as regards divinity, less than the Father as regards humanity. Although he is God and human, yet Christ is not two, but one. He is one, however, not by his divinity being turned into flesh, but by God's taking humanity to himself. He is one, certainly not by the blending of his essence, but by the unity of his person. For just as one human is both rational soul and flesh, so too the one Christ is both God and human." The Greek term hypostasis had come into use as a technical term prior to the Christological debates of the late fourth and fifth centuries. In pre-Christian times, Greek philosophy (primarily Stoicism) used the word. Some occurrences of the term hypostasis in the New Testament foreshadow the later, technical understanding of the word. Although it can translate literally as "substance", this has been a cause of some confusion; accordingly the New American Standard Bible translates it as "subsistence". Hypostasis denotes an actual, concrete existence, in contrast to abstract categories such as Platonic ideals. In Kierkegaard's Philosophical Fragments, the dual nature of Christ is explored as a paradox, as "the ultimate paradox", because God, understood as a perfectly good, perfectly wise, perfectly powerful being, fully became a human, in the Christian understanding of the term: burdened by sin, limited in goodness, knowledge, and understanding. This paradox can only be resolved, Kierkegaard believed, by a leap of faith away from one's understanding and reason towards belief in God; thus the paradox of the hypostatic union was crucial to an abiding faith in the Christian God. As the precise nature of this union is held to defy finite human comprehension, the hypostatic union is also referred to by the alternative term "mystical union". Apollinaris of Laodicea was the first to use the term hypostasis in trying to understand the Incarnation. Apollinaris described the union of the divine and human in Christ as being of a single nature and having a single essence — a single hypostasis. The preeminent Antiochene theologian Theodore of Mopsuestia, contending against the monophysite heresy of Apollinarism, is believed to have taught that in Christ there are two natures (dyophysite), human and divine, and two corresponding hypostases (in the sense of "subject", "essence", or "person") which co-existed. However, in Theodore's time the word hypostasis could be used in a sense synonymous with ousia (which clearly means "essence" rather than "person") as it had been used by Tatian and Origen. The Greek and Latin interpretations of Theodore's Christology have come under scrutiny since the recovery of his Catechetical Orations in the Syriac language. In 451, the Ecumenical Council of Chalcedon promulgated the Chalcedonian Definition. It agreed with Theodore that there were two natures in the Incarnation. However, the Council of Chalcedon also insisted that hypostasis be used as it was in the Trinitarian definition: to indicate the person (prosopon) and not the nature as with Apollinaris. Thus, the Council declared that in Christ there are two natures; each retaining its own properties, and together united in one person and in one single subsistence (εἰς ἓν πρόσωπον καὶ μίαν ὑπόστασιν, eis hèn prósōpon kaì mían hypóstasin). The Oriental Orthodox Churches, having rejected the Chalcedonian Creed, were known as Miaphysites because they maintain the Cyrilian definition that characterized the incarnate Son as having one nature. The Chalcedonian "in two natures" formula (based, at least partially, on Colossians 2:9) was seen as derived from and akin to a Nestorian Christology. Contrariwise, the Chalcedonians saw the Oriental Orthodox as tending towards Eutychian Monophysitism. However, the Oriental Orthodox persistently specified that they have never believed in the doctrines of Eutyches, that they have always affirmed that Christ's humanity is consubstantial with our own, and they thus prefer the term Miaphysite to be referred to as, a reference to Cyrillian Christology, which used the phrase "μία φύσις τοῦ θεοῦ λόγου σεσαρκωμένη", "mía phýsis toû theoû lógou sesarkōménē". The term miaphysis means one united nature as opposed to one singular nature (monophysis). Thus the Miaphysite position maintains that although the nature of Christ is from two, it may only be referred to as one in its incarnate state because the natures always act in unity. In recent times,[clarification needed] leaders from the Eastern Orthodox and Oriental Orthodox churches have signed joint statements in an attempt to work towards reunification. Likewise the leaders of the Assyrian Church of the East, which venerates Nestorius and Theodore, have in recent times[clarification needed] signed a joint agreement with leaders of the Roman Catholic Church acknowledging that their historical differences were over terminology rather than the actual intended meaning. ^ Aristotle, "Mund. ", IV, 21. ^ Placher, William (1983). A History of Christian Theology: An Introduction. Philadelphia: Westminster Press. pp. 78–79. ISBN 0-664-24496-3. ^ Gregory of Nyssa, Antirrheticus adversus Apollinarem. ^ Saint Cyril of Alexandria. St. Cyril of Alexandria: Letters. Trans. John McEnerney. Washington D.C.: Catholic University of America, 1987. Print. ^ "Theodore" in The Westminster Dictionary of Christian History, ed. J. Brauer. Philadelphia: Westminster Press, 1971. Loon, Hans van (2009). The Dyophysite Christology of Cyril of Alexandria. Leiden-Boston: Basil BRILL.